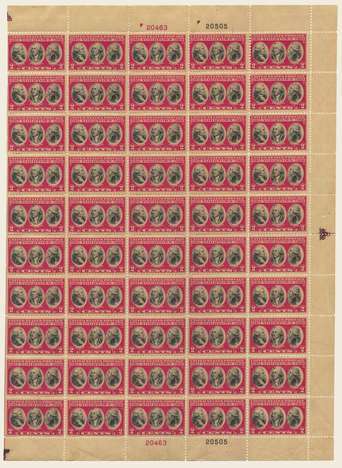 Scott #703 [1931 2c Yorktown; 1781 Surrender of Cornwallis at Yorktown; Generals Rochambeau, Washington, and DeGrasse] NH VF full sheet of 50 with natural straight edge at left. Red plate #20463 and Black Plate #20505 (without "TOP" inscription"). Nice arrows at right-center, top-left, and bottom-left. Red center line across middle. The normal color is termed by Scott to Carmine Rose and Black; this sheet looks a bit darker and might be the Lake and Black color variety (not the rare Dark Lake! ), but I cannot be sure, so offer it as the normal. Quality is excellent except for a marginal crease on the left affecting five stamps and causing a tear in the 3rd stamp down from the left -- however it looks great! Very strong perfs for this issue.